Taylor Patterson like most little girls was bitten by the horse bug before she could walk. Her first ride was at 10 months old! Taylor first started off doing Hunter/Jumpers and Equitation for about 10 years, training with the legendary Robert “Bob” Woodington. 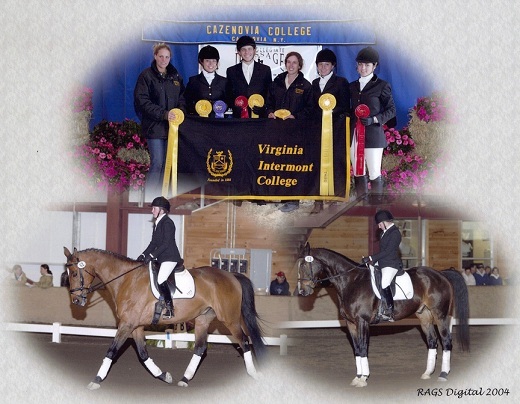 At Virginia Intermont college, she got introduced to the Dressage world and loves that just as much! Always up for new things as well as huntseat, Taylor has ridden saddleseat, western, endurance, gaited, racehorses, and driven! 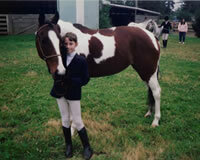 Since she was 12 years old, people at local barns started to ask her to ride their horses for rehab, starting, showing, and for pleasure, Taylor received tons of experience with all types and breeds of horses. 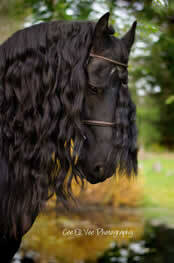 At 15, she began working with a trainer breaking and training horses which led to her start with Friesians. Working for Don and Lisa at French Creek Stables, is where she refined her technique and realized (for the millionth time) this is what she was going to do for sure with her life. In 2002, she headed East to the heart of horse country and earned a 4 year degree in Equine Studies and Business at Virginia Intermont College. There, she gained valuable experience in veterinary, teaching, riding, and all the wonderful business aspects of running stables, shows, and riding programs. 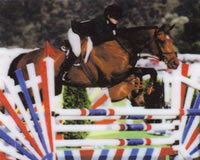 She also competed on both IHSA and IDA teams and was champion rider on both teams for her divisions. 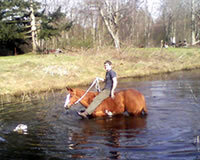 On both teams, you draw a horse and must go jump or perform a dressage test without ever have ridden the horse before! 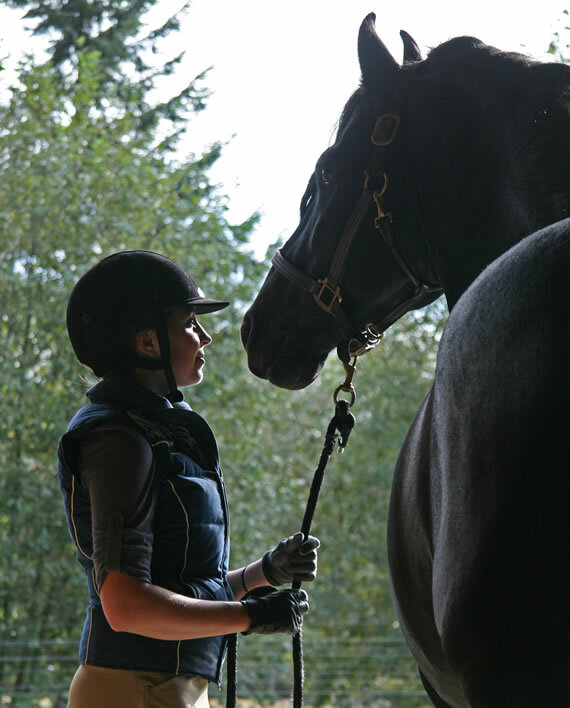 After college, Taylor worked for Denise Youell of Farpoint Farms as an assistant trainer and at a Warmblood breeding farm, training, showing and selling the young stock. Nick Patterson is the Jack of ALL trades. A Firefighter, welder, apprentice farrier, horse wrangler, and maintenance man who will fix ANYTHING, he is the one who makes Topshelf Training run smoothly or at all. Born around all types of farm animals, horses were like cows until he met Taylor. Now he knows different and is very educated on horses and is like a sponge soaking up anything he can on everything about them. He bought his first horse out of a field of 15 horses, brought her home, broke her and will never sell her! Patron is one of the most bombproof horse you can find!! 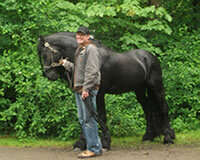 He is great at handling the horses, especially the wild stallions who need a manly hand sometimes! 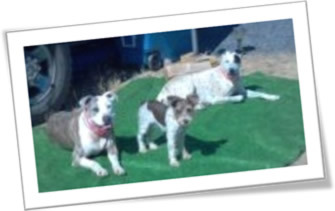 If you visit our home, you will more than likely first be greeted by our dogs, Toppy (Topshelf), Quilla (Tequila Rose) and Porter. Yes and no, Topshelf Training Center was named after the dog. He was named first, but Nick had always wanted to call his business that name as well.